Jeremy ​Henderson was the son of Jimmy (James) Henderson and Doris Josephine nee Watson, and descendant of John Henderson who, travelling from Alloa in Scotland with his wife Jane Hogg (a relation of the poet James Hogg), co-founded, with John Eadie, a tweed mill, Henderson & Eadie in Lisbellaw, 1858-1965. One of Ireland's most respected tweed manufacturers; In 1946 Princess Elizabeth was presented with a woollen rug when visiting Lisbellaw. Tweeds were sent to Japan and favoured by Paris couturiers during 1950’s. Henderson has two sisters, Mandy Bryson and the water-colourist Sandra Tweedie noted for her painting and silks. He is the cousin of Deirdre McCrory the award winning enameller and print maker, married to Michael McCrory the noted silversmith and father of the silver artisan, Cara Murphy. Henderson’s grandfather, Major John Alexander Henderson and father Major James Douglas Alexander Henderson (9th Londonderry (HAA) Royal Artillery) both served as High Sheriff of County Fermanagh in 1942 and 1964 respectively. The family was influential in the local community bringing the first electric generator from USA and installing the first telephone system in the area. Henderson's uncle, Gerald “Gerry” Gordon Lewis Henderson, became the first Canadian-born President of Chevron Canada and enjoyed an illustrious career, being awarded the C.S.P.G. (Canadian Society of Professional Geologist) Medal of Merit and in 1973 elected as a Fellow of the Royal Society of Canada. Henderson grew up in a traditional but creative house hold, where music, art and sport flourished. Henderson was talented with a natural ability in the arts and music, being proficient on the guitar. He spent much of his free time as a youth in sporting activities with his friends. Aware of his environment from an early age, he was sensitive to the deep colours and rich textures of the woollen tweeds and cloth that formed the background to his daily life. He also sensed the political unrest around him which later revealed itself in Henderson's art. Henderson’s art education was a large proportion of the 1970's and initially influenced by the current mode his works were abstract geometric, often with high key colours, strong perspectives and tension between forms. During this period Henderson exhibited at the Royal Academy, Institute of Contemporary Arts and in 1979 was selected for the Northern Young Contemporaries Exhibition at the Whitworth Gallery in Manchester, where he exhibited the vibrant geometric study Semper Idem, Tandava Stasis. “Like many artists, Jeremy struggled with the need to engage with the art establishment. I first met him at a Cork Street private view in 1979 the night after I had delivered a professional practice lecture at Chelsea. He said to me ‘I didn’t come to your lecture – people like you are not interested in the work.’ I suggested that the only way he would find out if that was true would be to invite me to see his work. He followed through on this and I subsequently visited his work space in the Chelsea School of Art studios at Bagley’s Lane, where he was working on several very large landscape-inspired abstract canvases”. Jeremy Henderson's art came to greater prominence when, in 1980 he was invited, by the eminent art critic Cyril Barrett, to exhibit at The International Connection - ‘A Sense of Ireland’, at The Round House Gallery, London, part of The London Festival of Irish Arts, a major arts festival where his work was shown alongside that of contemporaries such as Roy Johnston (who later used Henderson's art for his lectures in USA), Sean Scully and William Scott. The festival extended to 90 events at 44 venues across London. Opening on 4th February 1980, it ran for six weeks. Early in the 1980’s Henderson’s artistic work transitioned to landscape-based paintings. Retaining a strong affection for Fermanagh he revisited the places he knew so well from childhood; The area, Irish folklore and the border events of the time all influenced him. Initially, he worked large scale in watercolour to create vibrant interpretations of the landscape from Topped Mountain and overlooking Lough Erne. These are striking images, mysterious, metaphysical in intention and imbued with their histories. In Henderson’s own words “The Past Consumed in the Present”. The works in oil and watercolour were exhibited in 1987, first in Enniskillen and later at the Fenderesky Art Gallery, Belfast. Late in the 1980’s Henderson completed the ‘Present Memories’ series in the studio adjacent to the house he shared with his partner Jenni Stone with whom he had a daughter, Emerald. Soon after his relationship ended and for a short time he lived in an attic in Kingly Street, London. Here he painted the ‘Pilanurus in Soho’ series. Of the twelve works that formed this series ten were sold to the private art collector Randal Faulkner, who continues to collect his work and said of Henderson, “Jeremy showed me some of his work in his modest, understated manner. There was a 5’ x 5’ painting called ‘In Ireland, History Often seeps Through’, an Irish landscape which was tinged with red. For the first time I suddenly understood art. I realised that up until then I had been collecting names but not art”. In mid 1989 Henderson was invited, for the first time, by fellow exhibitor, Roy Johnston, to provide images for an important public lecture he was to give on Contemporary Irish Art at the Art Institute of Chicago. Henderson responded with typical generosity, sending images off almost immediately. As the decade turned into 1990 he moved to The Cooperage Studio (The old Truman's Brewery) in Brick Lane, East London, sharing the top floor with fellow artists; sculptor David Fusco and painter Bryan Benge, a contemporary from their days at Kingston. This was a time of considerable financial hardship; however Henderson remained productive in his ideas and creative work, living inside a tent erected inside the studio. It was during this period Henderson created the ‘City Manuscripts’ series. Around 1992 Henderson met the actor and painter, Patricia Martinelli with whom he spent the remainder of his life. Together in 1993 they moved to Lisbellaw following the death of Henderson’s mother, living in the old Georgian family house. During 1994 Henderson painted the ‘Hill of History’ series, which was exhibited at the Atlantis Gallery in London. In 1995 Jeremy Henderson and Patricia Martinelli were married, remaining in Lisbellaw until after the birth of their daughter, Bella-Lucia in 1997. Following a short period in London the family returned to Ireland in 1998, eventually purchasing and renovating the Old Barracks in Boho where Henderson set up his studio. After settling into home life Henderson refocused on more abstract works culminating in the ‘Finding Objects’ series inspired by visits to White Island and family life. Around 1992 Henderson met the actor and painter, Patricia Martinelli with whom he spent the remainder of his life. Together in 1993 they moved to Lisbellaw following the death of Henderson’s mother, living in the old Georgian family house. During 1994 Henderson painted the ‘Hill of History’ series, which was exhibited at the Atlantis Gallery in London. In 1995 Jeremy Henderson and Patricia Martinelli were married, remaining in Lisbellaw until after the birth of their daughter, Bella-Lucia in 1997. Following a short period in London the family returned to Ireland in 1998, eventually purchasing and renovating the Old Barracks in Boho where Henderson set up his studio. ​After settling into home life Henderson refocused on more abstract works culminating in the ‘Finding Objects’ series inspired by visits to White Island. ​Separate from his art Henderson's other great passion was his family and family life. spending time with family and drawing inspiration from his devoted partner and wife. 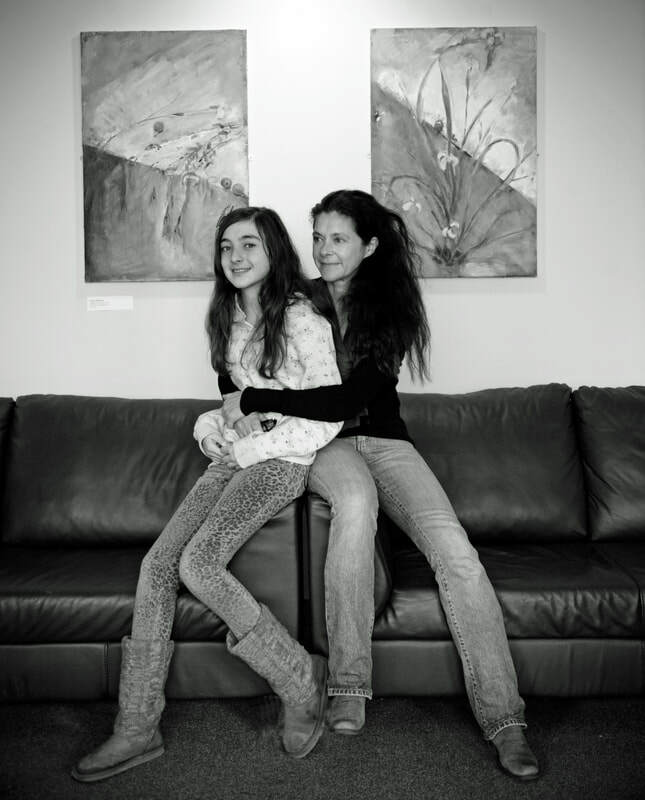 ​Opposite; an image showing Patricia Martinelli with their daughter Bella at the 2010-2011 Partners exhibition in Fermanagh Museum with works displayed in the background by Patricia Martinelli, an accomplished artist in her own right. In 2001, he was commissioned by The Northern Ireland Arts Council to produce Manuscript Vitreous Enamel wall panels for The William Jefferson Clinton Peace Centre in Enniskillen, which was inaugurated by President Bill Clinton in 2002. The preparatory drawings and final pieces are reminiscent of the more vibrant colours of his early work and are combined with the rich symbolism of the present and early Irish history alluding to Lough Erne and the illuminated manuscripts of the Book of Kells. Towards the end of his life he drew inspiration from the beautiful silent landscape of the Sillies river and tree forms near his home in Boho, County Fermanagh. These later paintings are more sombre in colour, but full of potent memories which resonate with the viewer. Henderson’s later linear; more mono-chromatic work is amongst his very best, large in scale and confident. At the time he stated “My recent work is concerned with the psychological process of object making. To create on canvas an open structure allowing aspects of the physical world or representations of it to emerge, so the paint may become invested with nuances and meanings”. In 2007 Henderson was diagnosed with a brain tumour. Following an operation later that year the family visited Spain 2008 where he painted ‘cactus forms’. He once described his artistic journey as, “moving from geometric hard-edged abstraction to landscape and back to organic abstraction”. It is apparent how all of these elements from the previous three decades culminated in the intensity of his late works. Following his return from Spain he painted from his bed. Henderson was a prolific and dedicated artist who continued to paint up to the end of his life in 2009. Jeremy Henderson was able to depend on the support and love of his wife and family throughout his illness.